Section headings and selected papers: Greenhouse Systems. Optimal control for plant production in greenhouses, H-J Tantau. Physical modeling of greenhouse climate, G P A Bot. The path to dynamic optimization of carbon dioxide in the greenhouse, W Day et al. Optimal greenhouse temperature trajectories for a multi-state-variable tomato model, I Seginer. Plant Factory Systems. Plant factory and its prospects, S Nakayama. Micropropagation by nutrient mist supply: effects of a mist supply period on potato plantlet growth, Y Ibaraki & K Kurata. "Roots dividing method" for nutrient supply in soilless culture, K Kurata. Development of TS-style plant factory, S Akagi et al. Post-Harvest Technology. Crack evaluation of rice by computer vision system, S Oshita et al. Quality evaluation of rice and coffee grains by using near-infrared rays, M Matuda & K Kagawa. Robotics. Mechanical weed control in sugar beet growing: the detection of a plant in a row, J Bontsema et al. Discriminating robot system for carnation seedling with fuzzy logic, H Fujiwara. Study on grape harvesting robot, N Kondo. Information, Computers and AI. Computer applications in agriculture and horticulture: a view, W Day. Agriculture information network trend for the 21st century, N Izumi et al. Models and Control in Agriculture and Horticulture. Process identification, a Markov parameter approach, T Backx. Kalman filter neuro-computing for biological system models using neural networks, H Murase & N Honami. Measurements in Controlled Systems. Sensors and intelligent sensing systems, H Yamasaki. An Isfet-based nutrient sensor for rockwool culture, I Amemiya et al. 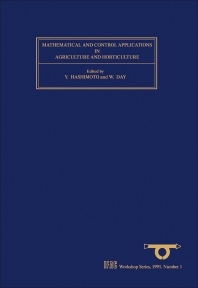 This title provides a general overview of recent developments and research into types of systems and their uses in the agricultural and horticultural industry. 64 papers are included, containing both theoretical models and applied examples for greenhouse systems, harvesting technology and plant factory systems.